TAR UC’s excellence in education is well-recognised across the southern region of Peninsular Malaysia as demonstrated by TAR UC’s Johor Branch Campus located in Segamat town. The 50-acre beautiful landscaped campus surrounded by lush greenery is approximately 20-minute drive from Segamat town. With a comprehensive array of facilities such as Training Kitchen and Restaurant, Bakery Kitchen, Mock Hotel, Aquaculture Lab and Mushroom Cultivation House, the students at Johor Branch Campus are well-trained professionally to be industry ready. Johor Branch Campus will house an ultra-modern ICT Learning Centre and an Entrepreneur Business Centre with shops and business square. This will propel the campus to be the core centre in the areas of ICT and entrepreneurship, nurturing a sustainable pool of young entrepreneurs and ICT experts for the country. The great outdoor awaits our students at Johor Branch Campus. 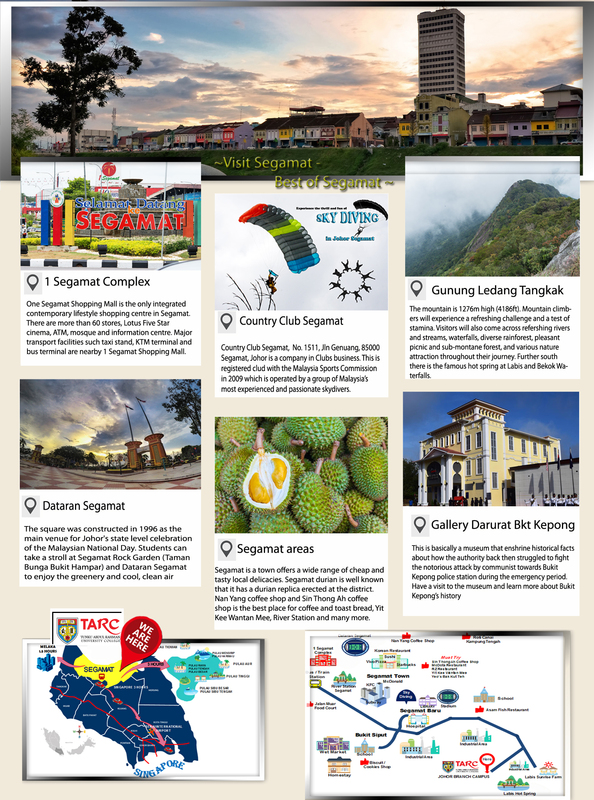 Segamat town will ensure our students a great weekend getaway at the famous Gunung Ledang with its hiking trails and waterfalls. Our students will not be denied of the modern comfort and lifestyle whereby they can have their dose of latest movies at the famous shopping mall at Segamat Central and their favourite cup of coffee at the famous Nanyang Kopitiam.